Sewol ferry Captain Lee Joon-seok has been charged with manslaughter in South Korea, reports say. 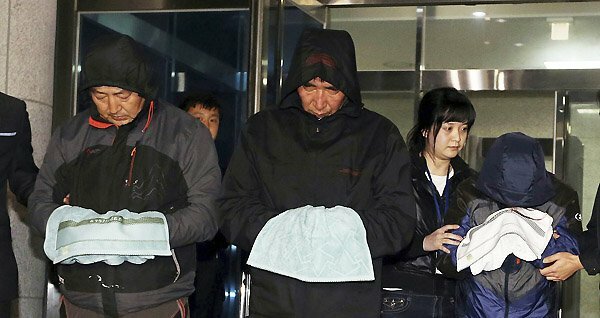 Lee Joon-seok, 68, is accused of leaving the ship as it was sinking while telling passengers to stay put, Yonhap reported. He was among the first to be rescued by coast guards at the scene. The Sewol ferry disaster on April 16 killed 281 passengers, most of whom were high school students. Another 23 are still missing. Besides Lee Joon-seok, three crew members – the chief engineer, the chief mate and the second mate – are also being charged with manslaughter. If convicted, they could face life imprisonment. “The [four people charged] escaped before the passengers, leading to grave casualties,” prosecutor Ahn Sang-don told journalists. Prosecutors have indicted another 11 crew members for negligence. Only 172 passengers survived the sinking of the ferry, including 22 of the 29 crew members. The authorities have also arrested several people who were not on the ferry at the time of sinking. These include five officials of the ferry owner, Chonghaejin Marine Company, and an employee of a private safety device inspection company. The latter is suspected of conducting poor inspections of the ferry’s safety equipment. South Korea, meanwhile, is looking to reform its safety and emergency response system in the wake of the ferry’s sinking. President Park Geun-hye said on Tuesday that the government would soon release details of this move, said Yonhap. She has previously apologized for the way the government handled the incident, amid questions over the initial rescue effort. Following the recent death of a civilian rescue diver, Seoul also plans to provide psychological help for rescue workers “suffering from physical and mental agony”, said local media. It comes amid reports the ship, submerged for nearly a month, has begun to deteriorate, making it even more difficult for divers to search for bodies. Officials said that divers had spotted walls “getting weaker and about to collapse”. Rescue workers are now plotting new routes through the hull. Earlier reports said that some bodies had floated away from the ship, prompting workers to deploy nets around the site. Cher and Bruce Jenner headed for romance?